Located in the heart of Kern County’s Antelope Valley, the Pacific Wind Project encompasses approximately 8,500 acres of leased land. Less than 2 percent of the land area is occupied by wind turbines, allowing the balance to remain largely undisturbed. 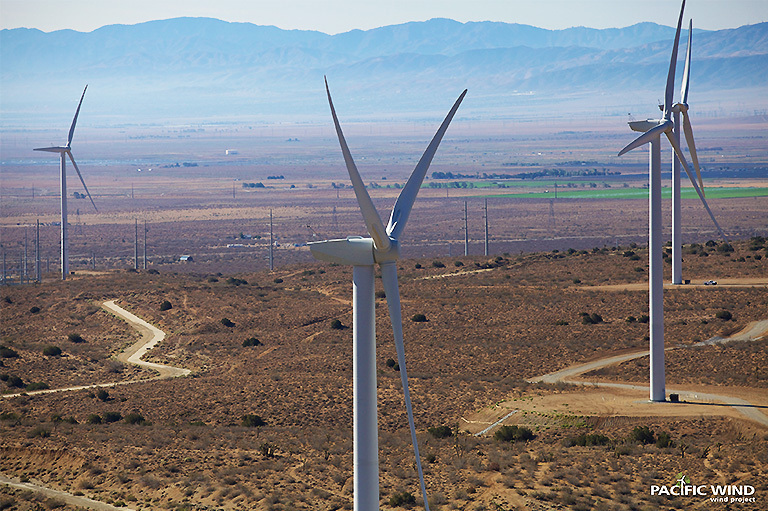 The 140 MW project consists of 70 REpower 2.05 MW turbines and interconnects into the new Southern California Edison Whirlwind power substation, constructed as part of the Tehachapi Renewable Transmission Project (TRTP). 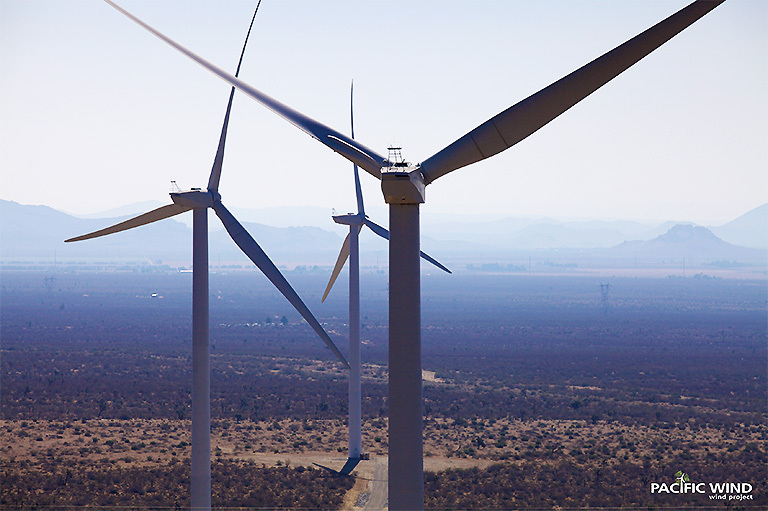 The Pacific Wind project contributes substantial tax revenue and sustainable jobs to the community. Over the life of the project, Pacific Wind is expected to generate over $324 Million in total revenue to Kern County businesses, government, and households. Additionally, the project will provide local economic benefits in the form of material, equipment and supply purchases from local businesses. Kern County has been identified by the California Energy Commission as a unique wind resource area. The county is a vital component in California’s renewable energy future. Energy generated from Kern County’s significant wind resources will contribute to meeting California’s Renewable Portfolio Standards, which require 33 percent of all electricity sold in California to come from renewable energy resources by 2020. 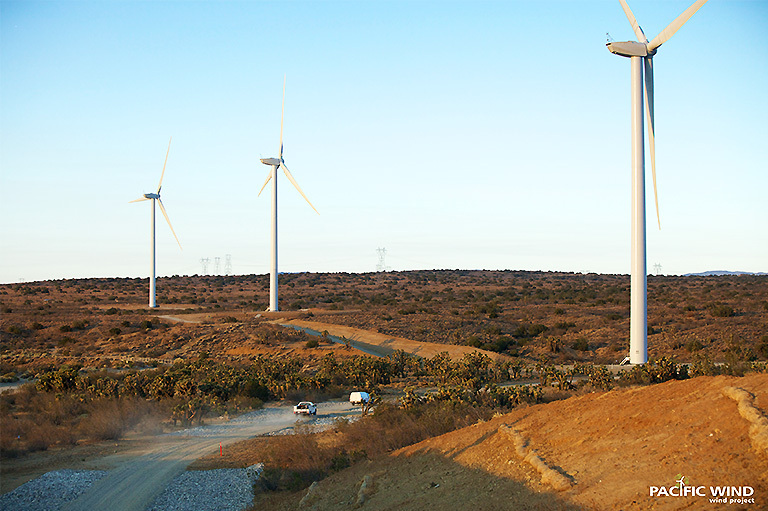 Pacific Wind started construction in the Fall of 2011, with commercial operation of the facility reached in August 2012. EDF Renewables will operate and maintain the Pacific Wind facility to exacting standards of excellence and environmental responsibility.